In honor of National Donate Life! Month, PortalWisconsin.org posts an article from the spring 2008 issue of Wisconsin People and Ideas. In "Every Day a Miracle," Joan Fischer takes a look at UW Hospital and Clinics' transplant program, some of the professionals who have made it a success and some of the patients whose lives it has touched. Wisconsin People and Ideas is published quarterly by our partners at the Wisconsin Academy of Sciences, Arts and Letters, an independent, nonprofit organization founded in 1870. The Wisconsin Academy celebrates the state's thought and culture. might not survive. But the father of four from Schofield, then only 55 years old, was at a point where if the transplant failed, he was willing to die. "My lungs had turned to mush," he says. "They just didn't hold air anymore. There was a constant pressure on my chest, and I was always gasping for breath." Even walking to his mailbox left Gerbig wheezing and needing several rest stops. For more than four years he had been living on a leash--a 75-foot hose with nostril tubes on one end and a concentrator, a noisy pump that generates oxygen, on the other. The hose allowed him to navigate his tri-level home, and when he went out, he dragged along an oxygen tank. He had had to give up his career as a purchasing agent at Wausau Metals (now Wausau Window and Wall Systems) and was living on long-term disability. Such severe limits on his mobility and interaction with the world were hard for a man who'd been both athletic and sociable. Gerbig had had problems with his lungs literally since birth--he'd been born with pneumonia and suffered from various lung ailments and infections all his life--but he'd always managed to play softball and baseball, bowl, and golf. As his lungs continued to erode, he'd had to drop those pursuits one by one. "It was depressing," he says. Eventually Gerbig was diagnosed with bronchiecstasis, a chronic pulmonary disease in which airways become misshaped and obstructed. His blood-oxygen level dropped so low that he was declared eligible for a transplant. By the time he went into surgery, he was ready to leave that life. "I figured either I'll wake up or I won't," he says. "The hard part was leaving my family." But Gerbig did wake up--and will never forget taking his first deep, painless breath in many years. The relief provided by his new lung was immediate. It felt like a miracle, he recalls. A miracle, yes--but it's an everyday story at the University of Wisconsin Hospital and Clinics' organ transplant center, one of the nation's best and busiest. The UW center currently ranks No. 1 nationwide in the number of kidney and kidney-pancreas transplants performed there (it recently marked its 1,000th combined kidney-pancreas transplant, a milestone no other program in the world has reached) and No. 2 among academic centers nationwide in heart transplant outcomes. The center's wait times and outcomes in liver and lung transplants are better than the national average, according to figures released by UNOS, the United Network for Organ Sharing, which oversees the national database of clinical transplant information and computerized organ sharing system. The center is addressing a recent decline in the number of lungs accepted from donors and already can report improvements. the nation's most advanced programs for transplanting these insulin-producing cells from the pancreas). The UW Health Organ Procurement Organization (OPO) also receives national honors. It was the only OPO in the nation to be recognized for its performance in every assessed area of activity when it received the Medal of Honor at the U.S. Department of Health and Human Services National Learning Congress in October. meaning that a majority (about 50.1 percent) of the state's drivers and identification card holders have designated themselves as organ donors. Another notable statistic: Wisconsin's "conversion rate," that is, the number of times organ transplants occur out of all cases in which transplants are possible, is 83 percent compared to 63 percent nationally, according to the U.S. Health Resources and Services Administration. These achievements have been bolstered by legislation. In 2000, Wisconsin became the first state to require at least 30 minutes of instruction about organ donation in driver's education classes ("Kelly's Law"). In 2004, Wisconsin became the first state to have a law ("Cody's Law") to help people offset the costs of organ donation, allowing for an income tax deduction of up to $10,000 in travel and lodging expenses or lost wages of a person who donates an organ as a living donor. Such steps take us closer to addressing the biggest problem facing the field: a severe shortage of organs. Political debate focuses on how to address that shortage while continuing to respect the individual's right to determine what happens with his or her own remains and those of loved ones. Nearly 100,000 men, women, and children in the U.S. currently need organ transplants, and another name is added to the waiting list every 12 minutes, according to Donate Life America. Every day an average of 18 people die from a lack of available organs. And the need is growing. "By 2010, the waiting times for deceased donor organs will likely double, and short of a radical restructuring of the procurement system, this state of affairs will exclude the vast majority of potential recipients from ever receiving a transplant, simply by attrition from death," writes nephrologist Benjamin Hippen ("The Case for Kidney Markets," The New Atlantis, fall 2006). Only about one in 20 patients with kidney failure will be able to receive a transplant, and the waiting time will approach nine or 10 years unless a privately arranged living donor can be identified, Hippen says. Organ transplantation is nothing if not a team effort--an intricate, time-pressured choreography often involving grief-stricken families, far-flung emergency and organ procurement teams, transport of organs by land and air, and hospital and surgery staffs in distant locations. Likewise, the rise of the UW transplant center to its current status has been a team effort, the fruit of decades of pioneering work in research, refinement of surgery techniques, and the training and development of surgery, procurement, and other staff at all levels. But a few key figures stand out. Chief among them is Folkert O. Belzer, who led the world in discovering, during the 1960s and '70s, innovations to keep organs viable. In 1971, he was able to transport a kidney from San Francisco to Holland, the first transcontinental, trans-Atlantic sharing of an organ. In 1987, he and James Southard, a UW biochemist, developed the "UW solution," a fluid that (when used with a pump) can keep donated organs viable up to 72 hours. The extra time allows for better matching of organs and recipients, thus reducing rejection rates. Its discovery also greatly reduced the cost of transplants by allowing organs to be transported on commercial rather than chartered flights. The UW solution revolutionized the field of transplantation and for many years was the most widely used. Another driving force is Hans Sollinger, one of the nation's most sought-after kidney and pancreas transplant surgeons. Sollinger joined the UW in 1976, leaving his native Germany for an opportunity to do postdoctoral work in the lab of eminent immunologist Fritz Bach. But soon after arriving Sollinger felt the call of the operating room and decided to add surgery to his research repertoire. He did his residency under Belzer and during the 1980s and '90s logged in some historic findings of his own. 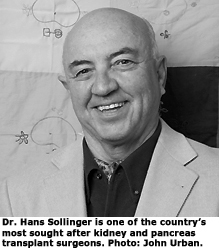 Sollinger established the UW pancreas transplant program in 1982 and the following year developed the "Wisconsin technique," a surgical procedure that allowed the survival rate of kidney-pancreas recipients to more than double worldwide. Another key achievement: development of the immunosuppressive drug mycophenolate mofetil (CellCept), which was approved by the FDA in 1995 and today benefits more than 300,000 patients. 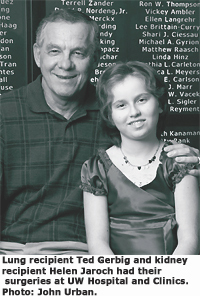 When Belzer passed away in 1995, Sollinger succeeded him as director of the transplant program. He also serves as medical director of the UW Health OPO. Sollinger's research is still going strong--and, ironically, his focus is on a procedure that could greatly reduce the need for transplant surgery. For the past dozen years he has been trying to get liver cells to produce insulin through genetic manipulation. Research done on animals has proved promising, and he hopes to soon move ahead to clinical trials with humans. If he succeeds, this would be a breakthrough in curing diabetes, a disease that affects more than 20 million people in the U.S. each year. "This is the dream of my career," says Sollinger. Over in the heart and lung area, the UW acquired the head of the nation's biggest heart transplant program when Niloo Edwards came from Columbia University in 2003 to become chair of cardiothoracic surgery and the surgical director of cardiac transplant. 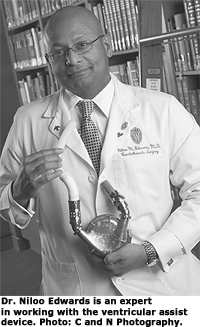 Edwards is one of the country's most proficient surgeons in working with the ventricular assist device, also known as a VAD. The VAD, a battery-powered pump, is implanted into the abdomen and connected to the left ventricle of the heart, helping weak hearts continue to pump blood through the body. It serves patients as a bridge to receiving a transplant, enabling patients to survive the wait, or as a life-prolonging alternative to patients who are not eligible for a transplant. The UW has ranked No. 1 nationwide for several years running for outcomes with VAD patients, notes Edwards. Edwards considers the advancement of such devices, which reached new levels of efficiency and sophistication in the '90s and early '00s, to be the most exciting area in his field today. "The reality is that we are limited in terms of transplant by the number of organs that are available," says Edwards. "The advantage with these devices is that, while they may not be as elegant or as easy to live with as a transplant, they are available off the shelf. And that's something that is particularly exciting because, as the field continues to advance, hopefully it will completely replace transplant." When it comes to transplants what's been most exciting, Edwards finds, are the steadily increasing success rates. "You look at where we were in the 1960s and early 1970s, and your chances of surviving a heart transplant were about 30 percent for one year. Cyclosporin came along and it jumped up into the 70s [in percentiles]. Every year, small improvements and refinements have been made such that now your chances of surviving a year are 90-plus percent." His observation underscores the timeline of transplantation as a whole. This miracle field is younger than the average baby boomer. The first successful kidney transplant was performed in 1954, the first successful pancreas transplant in 1966, and the first successful heart and liver transplants in 1967 (lung transplants did not come until the 1980s). We can only marvel at how far we've come so quickly. Ted Gerbig would be the first to say that receiving an organ transplant not only saves your life, it changes you forever. Few other acts offer such evidence of human compassion and goodness. It is a rare, almost unmatched opportunity to turn one's own crushing loss into another person's, usually a stranger's, salvation. The young nieces of Gerbig's donor call him "Uncle Ted" and ask to touch his chest or listen to his breathing. It reminds the children of their deceased Uncle David, and with good reason. David Duranceau, of Green Bay, gave Gerbig a lung. Gerbig has gotten to know the Duranceau family well through this extraordinary bond. What makes their story even more eventful is that Duranceau had been the recipient of a kidney and pancreas. Duranceau was diagnosed with diabetes at age 11 and was facing kidney failure by the time of his transplant at UW in April 2003. The transplant was successful, but only three months later, in an unrelated incident, Duranceau died of an intracranial hemorrhage--bleeding within the skull caused by a ruptured blood vessel. For the Duranceau family, the decision was clear. Following David's wishes, they sought to help other people as David had been helped. One of Duranceau's lungs saved Gerbig. The other went to a Michigan man whom Gerbig also befriended and now calls his "lung brother." Even Duranceau's previously transplanted kidney went on to save another life. Taking Duranceau's lead, Gerbig plans to be a donor himself. "I'm sure I have parts they could use," he says. "My liver's still good, my kidneys are still good, my pancreas is good. I get my blood checked every two months, so they know I have good organs." Gerbig and his family are emulating the Duranceaus in another important way: they have become fundraising advocates for organ donation. For the past four years, the Duranceau family has held an annual David Duranceau Memorial Golf Outing under the auspices of the David Duranceau Foundation. Proceeds go to the UW Health OPO and the Restoring Hope Transplant House in Middleton, a planned "home away from home" for patients who are in the Madison area for bone marrow or other organ transplants. That event has raised at least $100,000 since its founding, according to UW Health OPO executive director and transplant surgeon Anthony D'Alessandro. Inspired by that story, Gerbig and his wife Shelby got together with Janet Lawrence, a Wausau woman who donated a kidney to her mother, and Cheryl Brown, a family friend. They founded the North Central Wisconsin Understanding Donation Donate Life Foundation with the purpose of promoting awareness of organ donation in their region. As a fundraiser, last summer they held the First Annual Race for Life Scavenger Hunt, a zany event in which teams raced around greater Wausau checking off activities that included posing for a photo with a bride, milking a cow, and climbing a tree. This year's event takes place on April 19 as part of National Organ and Tissue Donor Awareness Month. "The awareness in the Wausau area has grown in leaps and bounds over the last four or five years," says Gerbig. "There are people who actually put in their obits now that they donated their organs. There are editorials about it now. When they see that we're doing a scavenger hunt, we get people calling up who have donated their loved ones' organs or tell us how appreciative they are that we're finally getting the word out in the Wausau area." Gerbig reflects upon the blessings of his life over the past four and a half year--things his doctors confirm he would not have lived to experience without the transplant. They include walking his daughters down the aisle; the birth of his two grandsons; and, most poignantly, spending time with his own parents during their fatal struggles with cancer. He is grateful he was there to offer them help and comfort. "I owe such a debt of gratitude to so many people," he says. On a lighter note, during his first game of golf after surgery, he shot the first hole-in-one of his life. Talk about miracles. Gerbig notes with a laugh that this, too, must have been a special gift from Duranceau, who had been a passionate golfer. 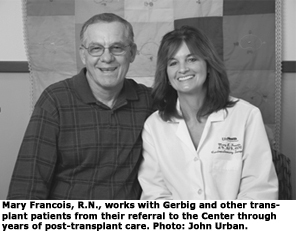 What's the one thing Gerbig would most like for people to know about organ donation? "How simple it is to save somebody's life," he says.